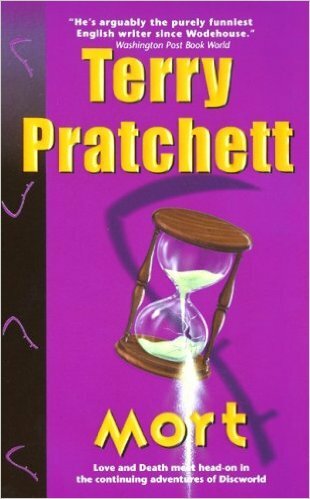 Mort is my first forey into the Discworld domain of fantasy author Terry Pratchett, and I found it fascinating. Perhaps it is fate when the teenaged boy, Mort, fails to get a job on his visit to the hiring fair in Sheepridge, and in the dark long after everyone else has gone home, is apprenticed to Death. The book is written in third person, and Death speaks in capital letters without the need for speech. Death in Discworld is the familiar figure we know, and yet he is not. Because this Death has built a family, now comprised of our protagonist Mort, Death's daughter Ysabell (of the silver hair and eyes and a figure reflecting too many chocolates) and his manservant named Albert (stick-thin, raw-nosed and some two thousand years old.) This family lives in a non-reality outside of time and space "known to the few astrophysicists who have taken really bad acid" in which Death has carved a domain where his human family exists. Death's home contains myriad parts, including a stable where live the finest of Death's live horses, a black garden, a library where resides the books into which each soul is written; a kitchen where Albert cooks meals for Mort and Ysabell. Before Death begins to teach Mort how he performs his office, and of course, it all goes awry, Mort agrees he wishes to "learn the uttermost secrets of time and space," and is sent on his first job to clean the stable, where he meets Death's horse, Binky. I can see why Pratchett's books are so popular. Mort is everyman (or perhaps Everyboy) and Death is a surprisingly sympathetic character; one can certainly understand why he would wish to have a vacation. Pratchett's blend of myth and humor is charming like a fairy tale, humorous in a personal way, compassionate, and quirky. I can see why his books are so popular. Dating back from when I was in college and had to read Devil in a Blue Dress to compare it to the movie of the same name, I have been a Walter Mosley fan; that’s been a long time I’ve had to read a lot of the Easy Williams series. The curious novella,Jack Strong,is the first work of Mosley’s that I’ve read that was speculative fiction. The point of view character, Jack Strong, is no ordinary man, but is not only physically compiled of the bits and pieces of a number of people, but mentally composed of their unbearable intimacies, the things they knew (while they were alive), the secrets of the dead, and sometimes their hidden impulses. With this chaos in Jack’s head, he wakes in a Vegas Hotel room. We find later he had been taken there by a doctor and nurse. Reading the character of Jack Strong is an experience that must be like living as Tara, in the United States of Tara, or inside the head of Shirley Ardell Mason, the woman about whom the book Sybil was written. Jack Strong is, as he puts it, “schizophrenic with side orders of multiple personality and delusions,” except that the memories he has are also reflected in his patchwork body. The book is written in first person, but that first person fluctuates between Jack and whichever of the personalities needs to be on stage. The premise is an ambitious one, and plays out a somewhat obtuse pulp fiction plot. If I had a criticism, it would be that the story begins “in media res” to the point that it is a struggle to figure out what—and who—is going on. The questions come in cascades: whose memories are these? why is he going to the casino? Why did he kill these thugs? Why is this character made up of other people? The answers are in trickles. Tom Grog, representative of the Convocation, could provide explanations, but he says only that Jack is “the phoenix” and Grog is only there to witness Jack’s “rebirth and transformation,” and only leads to more madding questions. While Jack Strong lacks the ring of meticulous truth of Easy William’s voice, he is a character who is strong and in control, almost the template of a dissociative X-Man lead woven of strange twists. Mr. Mosley, I feel compelled to ask, where is the rest of the story?